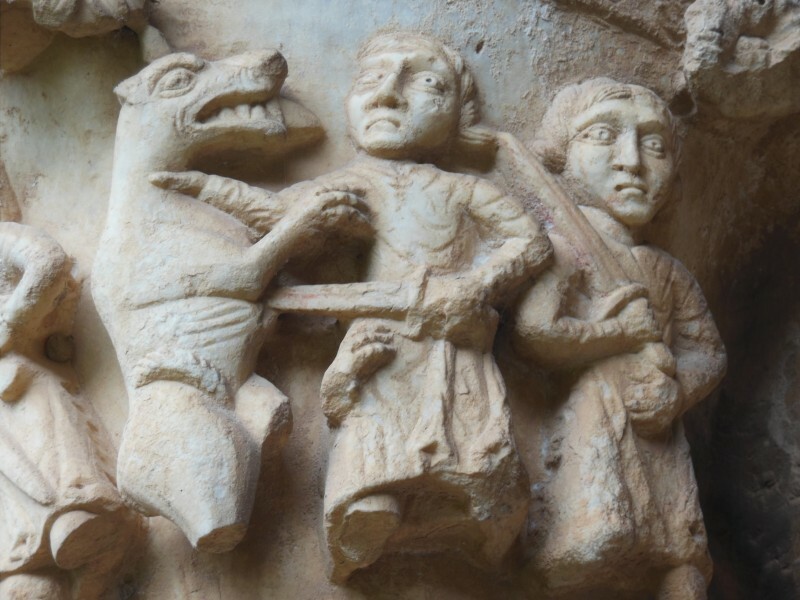 There’s a certain reaction I have, when looking though an art history book, an “Aha, there you are!” recognition that’s–let’s face it– a sense of entitlement. 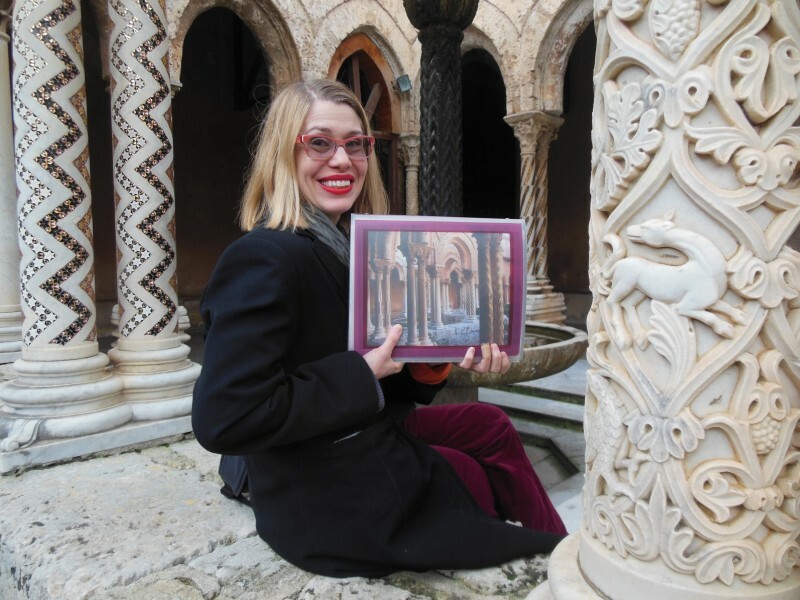 I study the reproduction of a building or artwork and say to myself with certainty, “I am going to go see that.” Without fail, I have always felt just that entitlement whenever encountering an image of the cloister of Monreale Cathedral in Sicily. 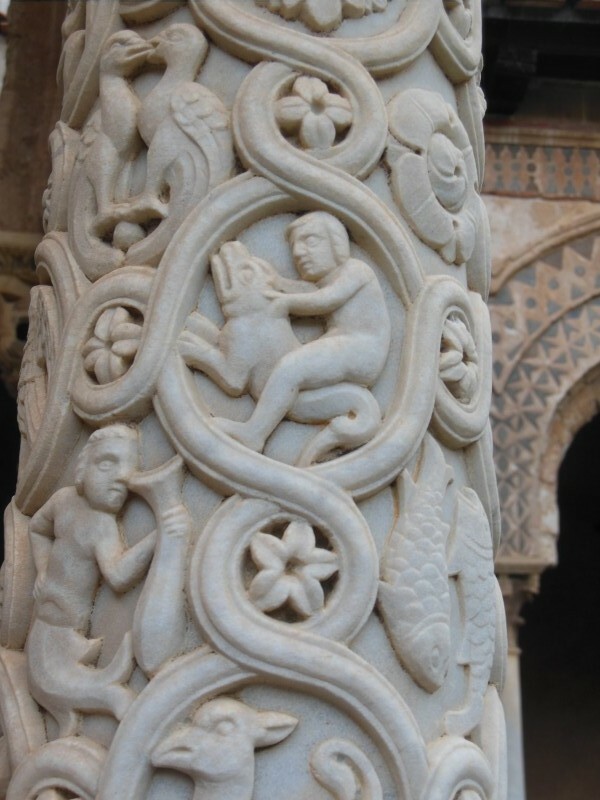 This spring I walked out of the art history book and into the cloister of Monreale. 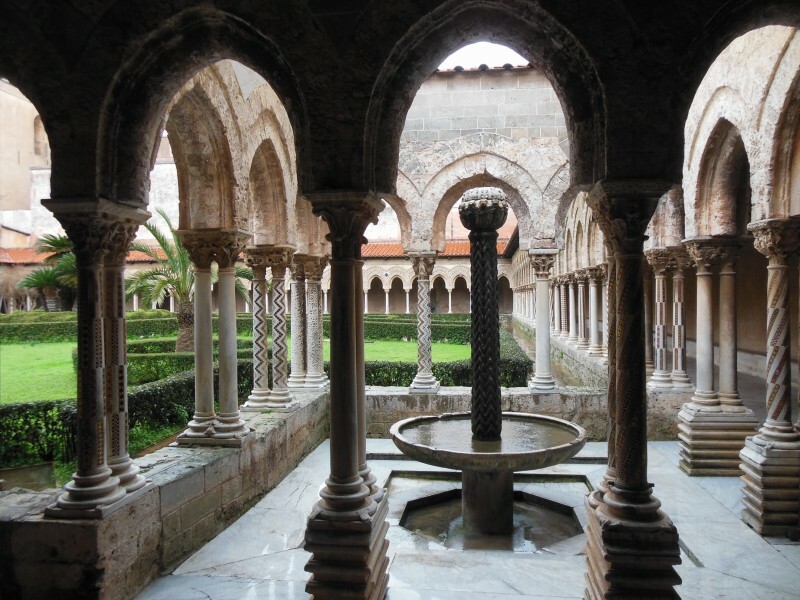 Cloisters always attract me with their sense of tranquility and meditation. 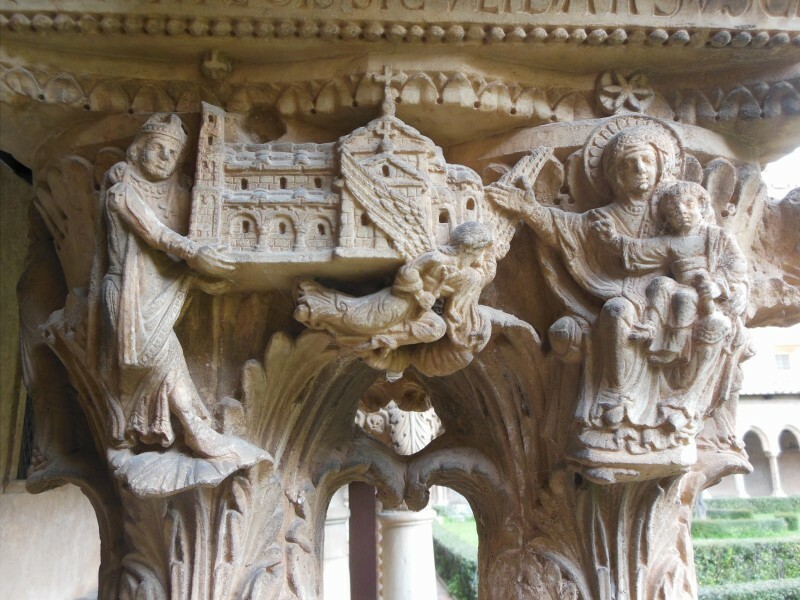 They were meant to provide monks a taste of their heavenly reward to come, and Monreale cloister was planted with the fruit trees of paradise (fig, pomegranate, olive, etc). It also must have just been a refreshing spot for a bit of exercise or fresh air. Constructed around 1180, it’s a 140 foot square of lavish loveliness. The arcaded galleries have 26 pointed Islamic-style arches on each side supported by twin columns of white marble. 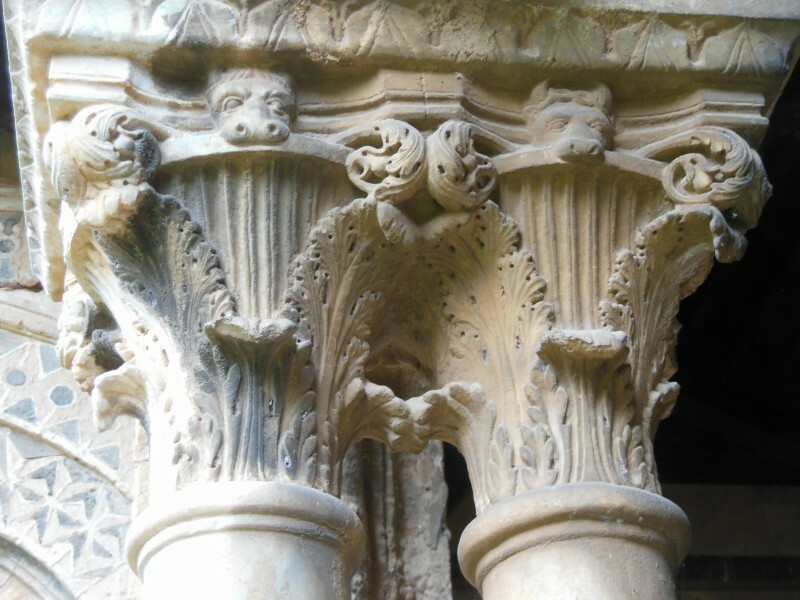 The columns are either encrusted with intarsia of colored marble or are delightfully carved. 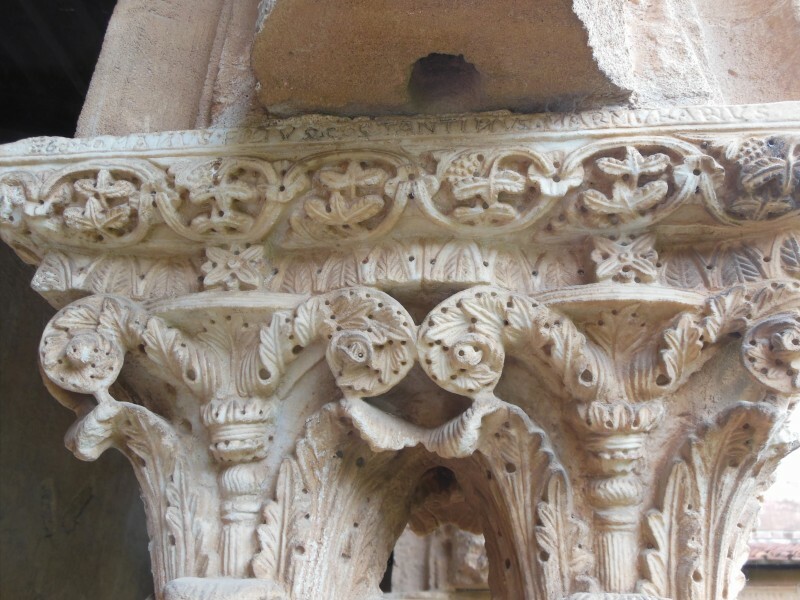 The columns are topped with Romanesque carvings. And most charming of all, in one corner is an exceptionally ornate basin and fountain in the form of a stylized palm tree. After hanging out in the cloister a while, we noticed that the columns didn’t seem to quite match up to the arcades, as if a different size was planned and there was a last minute substitution. 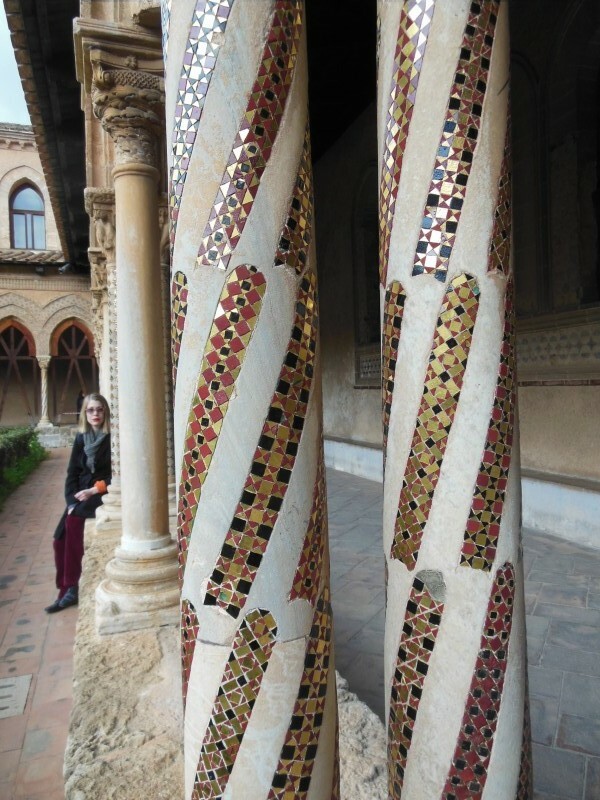 According to my research, the columns are made from marble thought to be recycled from a sunken Roman city. 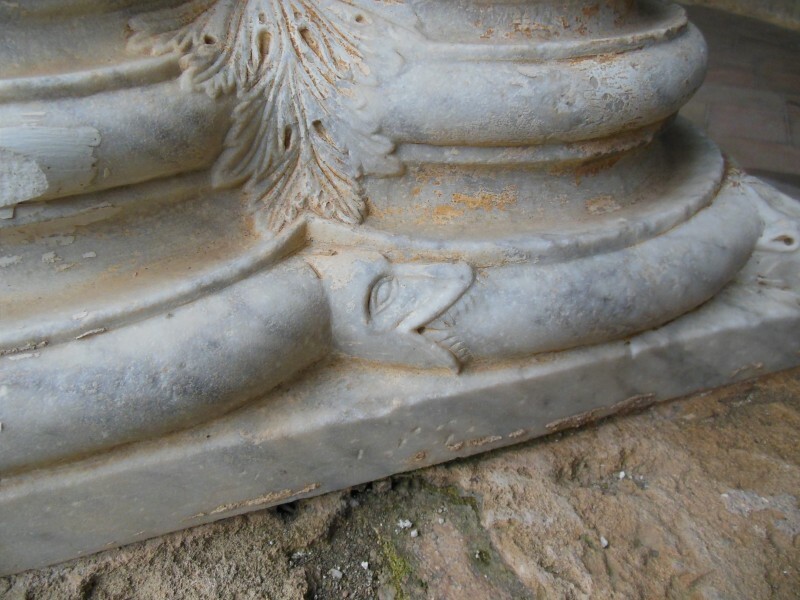 On close inspection, you can see small holes in some of the columns which apparently were made by a form of underwater snail. 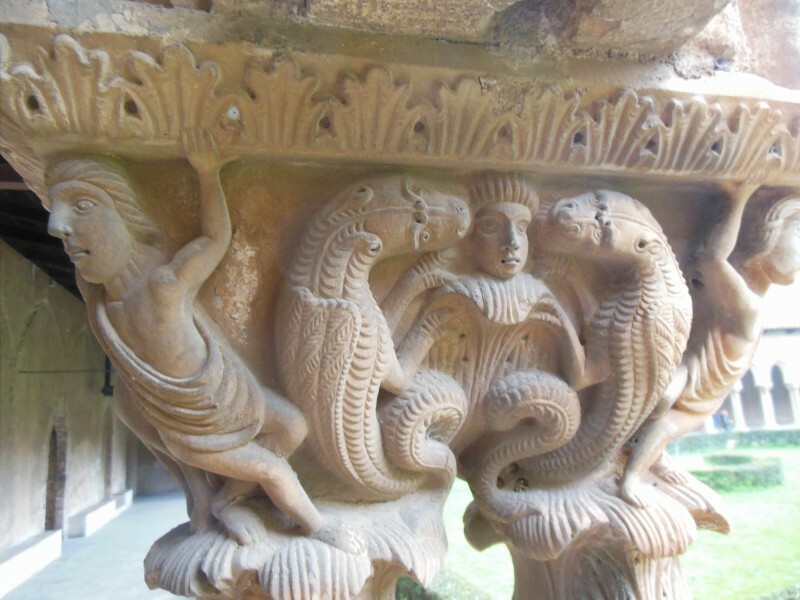 Because, you know, it’s not cool enough to be the Romanesque cloister of a a stunning Norman-Byzantine church with world famous mosaics–you also have to be made from a sunken lost city. May my sense of entitlement lead me and my handsome gentleman companion to many more wonders of art history. 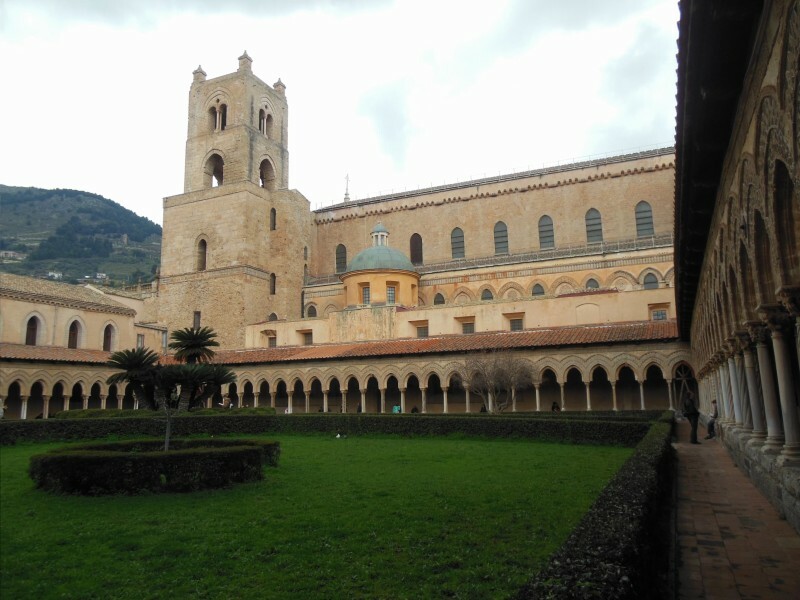 How we got to Monreale: bus from Palermo. Where we slept: Ariston Hotel b&b. Price: €55 for a double. Recommended: yes. HOB loves him some Saracenic-style arches. This is the lavabo (ritualistic hand-washing basin). 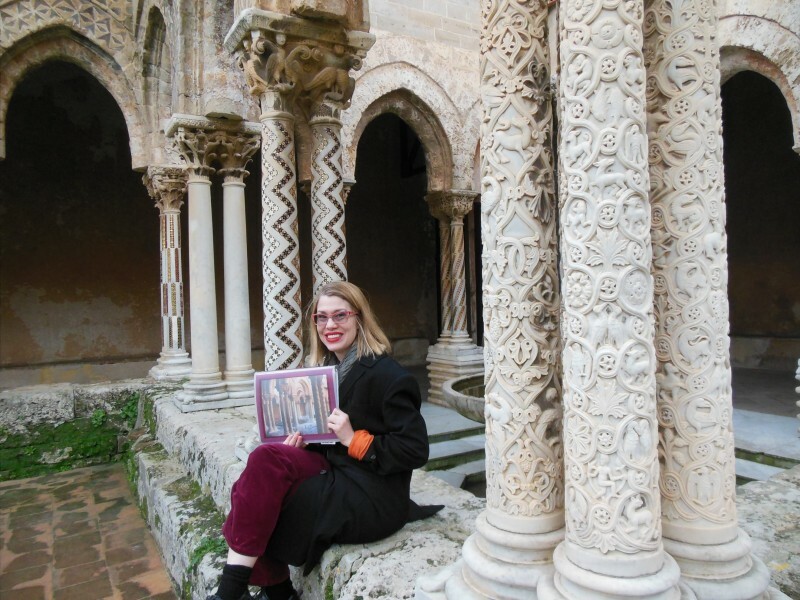 Me hanging out in the cloister holding my research about the cloister. It’s so meta. 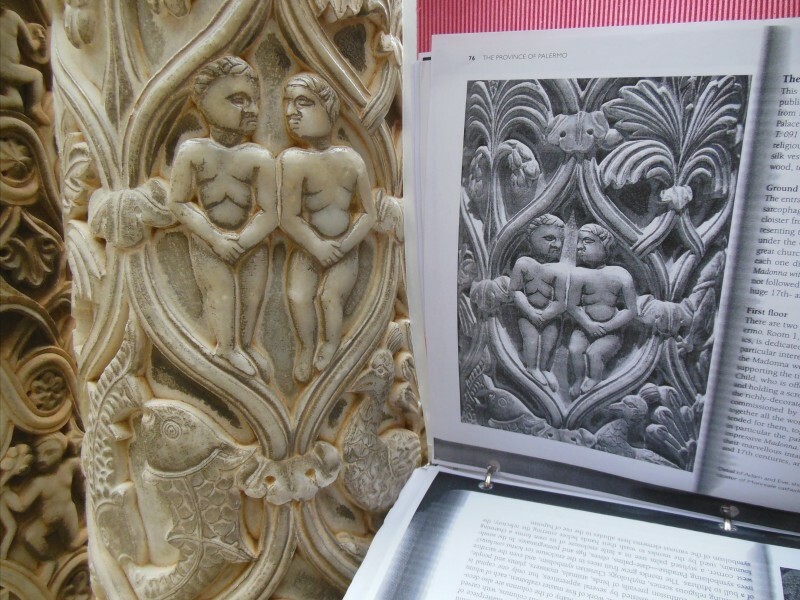 Adam and Eve, feeling ashamed of their nakedness and trying to hide their junk. Below that a Pisces symbol. 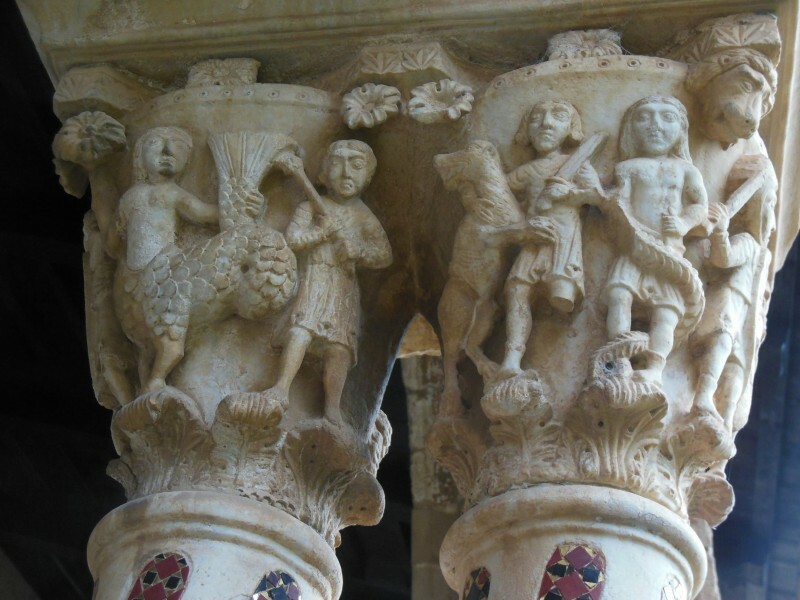 (The secular and the biblical: it’s all mixed up in these pillar carvings). 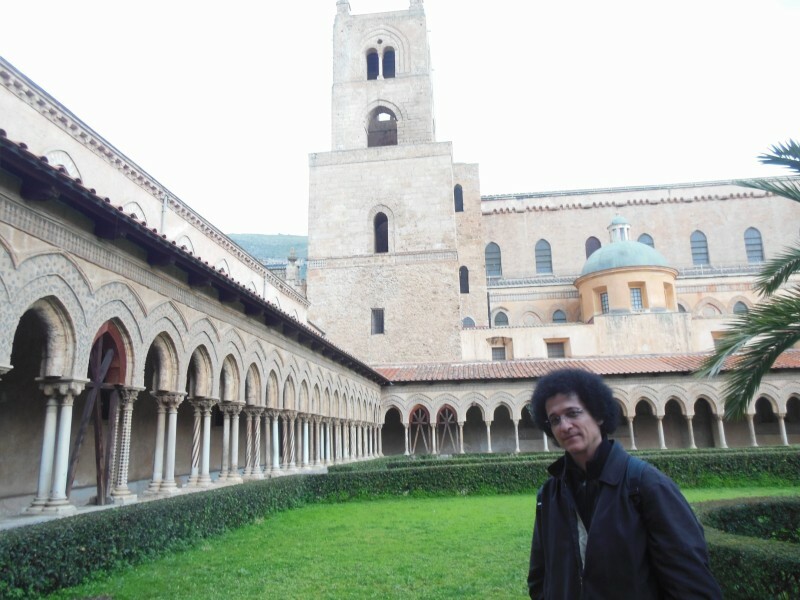 If I were a monk at Monreale, this would have been my reading nook. King William II: Hey Virgin Mary, let me offer you this cathedral! Virgin: Why are these kings so convinced I want all these cathedrals? I wish someone would offer me some sweet suede boots from Bloomingdale’s instead. Baby Jesus: Peace out man! There are 228 gorgeous twin columns. 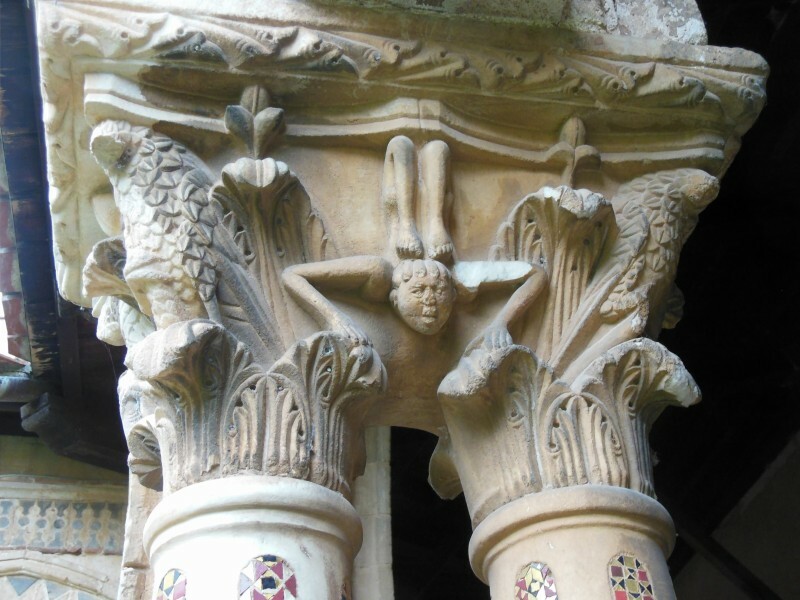 Besides the beautiful capitals and columns, it´s also really cool that we see clearly how the Arabic pointed arches became integrated with Romanesque sculpture-a true hybrid piece bridging Romanesque to Gothic. Thank you for sharing this! I agree Nathan–it is really cool. The inside of the cathedral was also spectacular. I hope to writing about it soon. Thanks for reading!